My whip making friend David Crain came over to have a look at my new Cowboy Fast Draw Association equipment and to deliver some repairs he made to my firewhips, which had evolved into a bad state. The firewhips hold up well under regular use, but I am hard on them and apply more force and speed than they are intended to handle. When they are typically used in shows, they are more or less a cosmetic application. Most people are happy to see a bullwhip on fire. But the way I use them I do the way I write about them in my Cliffhanger stories. There have been readers who have read The Curse of Fort Seven Mile chapter titled “Sacrifice to Santa Maurta” who have doubted that Cliffhanger could have eradicated a whole gang of drug dealing scum bags armed with guns using just a few flaming firewhips which tore open their necks with precision cuts. Even when I do the firewhips in regular speed it is hard for people to see what’s going on, so David and I slowed down the action with footage photographed at 240 fps so that viewers could see what was really going on with firewhips as they circle around my body during use. In the case of the Cliffhanger story, the bandits didn’t have a chance. The action happened so fast that their superior numbers were no match for the flaming whips—which is usually how it is in real life as well. Like I’ve said, my fiction has to reflect reality. This video will show a bit about what I’m talking about. During that video I sped up the time to normal a little over the halfway point to show how fast the whips were really traveling so that it could be seen what was going on during all the slow motion footage. With all the smoke it is easy to see the shock waves that come from the sonic booms at the end of the whip, and it is also easy to see the precision of the cuts. If those cuts are directed at a target they do lay open flesh with the same ease that a knife cuts away flesh. So whips can be extremely dangerous to work with. It should also be noted that I am not wearing any kind of gloves for protection, and that I am easily slinging the whips around a poncho, just the way Cliffhanger does in that particular fight scene. For the uninitiated I can understand that they might think that scene was the work of fiction rooted in impracticability, because firewhips seem like a very exotic device devised in the modern-day of CGI graphics. But, they are quite real and I wouldn’t write about them the way I do if I couldn’t or haven’t experienced such a thing in reality at some point. I have worked with bullwhips for years and have even used them in very urban settings, so when I write I am working with a pretty extensive library of experience. The poncho that I’m wearing is something I’ve had for a very long time and is one of my favorite items of clothing. Most people know me from suits and other forms of business attire, but around my home it’s what I wear the most. Many years ago I lived on the University of Cincinnati campus for over a year. It was during a time when the grunge music scene was just emerging and people were starting to dress to reflect that Seattle music invasion which to me was a meditation on communist propaganda. So I rebelled in my own way from the trends of that day and as a young man in my mid-twenties who was very pleasant to look at, decided to go into a different direction. Attracting women was never a problem for me—so looking back on it with some measure of pride it took a lot of guts to walk around campus the way I did. I dressed exactly the way I appeared in that video everywhere I went. The poncho allowed me to wear my bullwhips around with me up and down Vine Street at 3 AM without anybody knowing they were there. When I rented movies, or went out for a bite to eat in the middle of the night, I dressed exactly the way that I appeared in that video—with that exact poncho. When all the other kids were cruising McMicken going from bar to bar with their hats turned backward and their polo shirts looking for love in all the wrong places, I was dressed with my poncho and hat just the way I appeared in that video. I dressed like that everywhere I went—and I did that for several years. And I did get into trouble, a lot of it at times. But I’m still standing and a lot of people aren’t. History has a way of defining winners and losers and I certainly applied that knowledge to my Cliffhanger character. So yes, the firewhips are real and the use of the poncho is too. I have a lot of experience with it. The poncho doesn’t catch on fire the way I work firewhips. 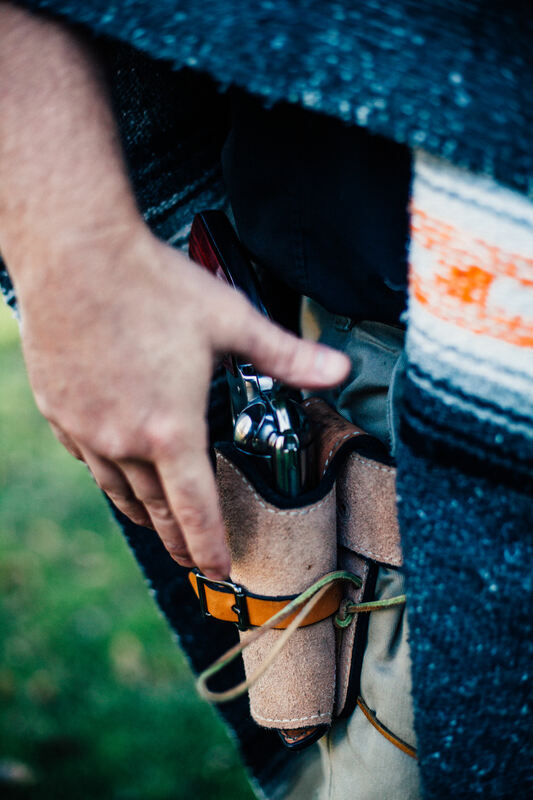 The poncho is effective in such combative circumstances that it conceals the weapons around the body of a fighter and it can also hide the hands so would-be assailants don’t know what your hands are doing or what direction to look from. Those types of tactics can buy those precious fractions of a second when most things happen. I dressed the way I did at that time because the temptation to assimilate was incredible at that age. It would have been very easy for me to put on the nice cloths that were expected of me and to become quite a gigolo. People much less gifted than me were having quite a lot of fun living that type of life. I purposely dressed that way because of the Cowboy Way that I have been talking about so much lately. I stood in opposition to the grunge scene and I lived as authentically to my values as possible in a hostile environment. I observed that nightlight on McMicken where girls dressed as sluts, Goth types wore their black lipstick and tattooed freaks roamed around with their new piercings in those early days of Seattle grunge that people didn’t expect to be harassed. So if a guy wanted to walk around with a poncho and outback hat everywhere nobody should gaze in my direction with scrutiny either. That’s the way I figured things should be. I mean most of the young men on Vine Street barely had their pants on as the whole pulling down the pants thing was beginning to appear in the ghetto culture—so my poncho and hat were not out of step. Of course people didn’t know what to make of it, because nobody else on campus dressed that way, but they had no right to say anything—because dressing the way they did—they had no room to talk. It’s like what I told my son-in-law about why I wore a cowboy hat, which I have previously discussed. The outfit to me was a signifier of distinction. I was not like those other people and I had no plans to ever be. And I’ve never looked back and wished I had done things differently. I can wear business attire now in professional environments because I know internally that I have done the hard work of affirming my authenticity at a critical point in my life when I was being measured from that point on regarding the scale of social orthodox. Society was moving in a direction I wasn’t going to go. So I held my ground when it mattered and maintained my authenticity. I learned a lot in college, I learned that to succeed in that environment I’d have to pretend to not be so smart, and that I’d have to make personal concessions to enjoy success. I wasn’t willing to do that starting with my attire and I’m very happy now that I held my ground. There was a Frisch’s down on Central Parkway where I ate breakfast and read my books each morning so that I could enjoy the buffet. Out of all my time on the U.C. campus those mornings were my favorite—I could read what I wanted, eat as much as I wanted, and be generally left alone. Most of the people at Frisch’s during that time were the old timers who had watched their neighborhoods fall into mismanagement during their lifetimes going from prestigious homes during the 1950s to slums by the 1990s—they enjoyed the way I dressed. Once a cop who ate there every day also and took notice of my outfit asked me why I wasn’t out with all the other kids “getting laid” and having a good time. I held up my book and my plate of eggs and bacon and told him that I was having a good time. Over two decades later I still dress the same way and pretty much do the same things. My friend David came over to my house and we played with fire for a while the way men are supposed to on a Saturday night. It’s the little things in life that matter and speaking of that—the Cowboy Fast Draw equipment that I assembled shortly after I wrote about it yesterday was much better than I had thought it would be. The Cowboy Fast Draw Association really has their act together. I was very impressed with how my order from them was organized. One thing became clear as I was assembling it—that there will be reason to make a whole lot of new slow motion videos with firearms just as I have with firewhips over the years. And that action will be even faster! I may dress the same, but in life speed and accuracy matters, and the older you get—you should get even better. I plan to.